It’s the most wonderful time of the year! This holiday season don’t let decorating wait until the last minute. With thoughtful planning, executing a complete decorating plan can become a new and fun family tradition! 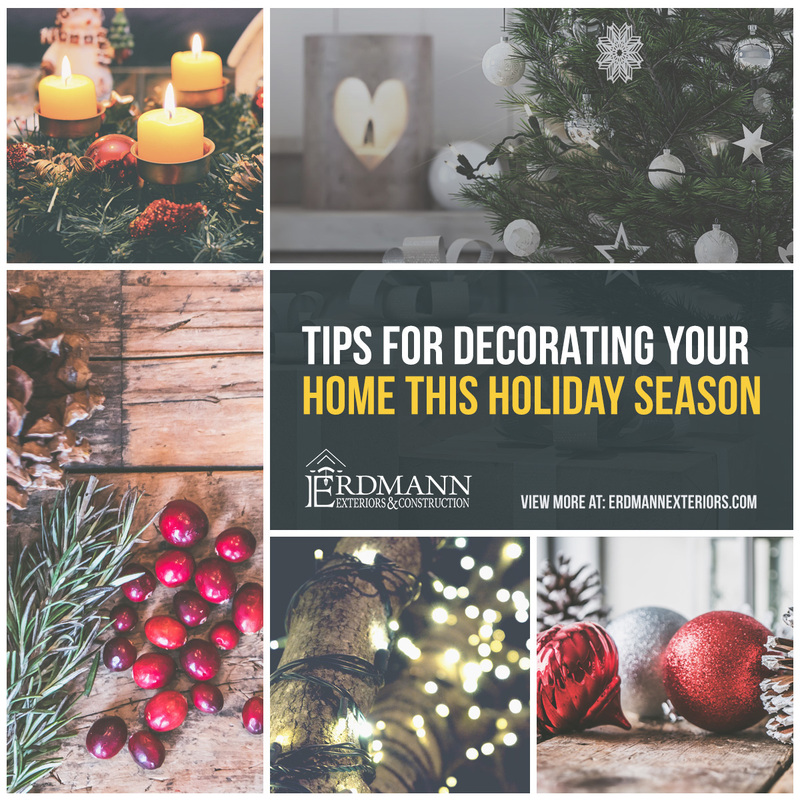 Transform your home – room by room, inside and out – with these tips and tricks and enjoy a beautiful (and safe) home this holiday. Let’s start with the inside. Walk through your house and identify the focal point for each room. Now ask, how can I make it seasonal? To keep it simple (and doable) first use what you have. After pinpointing the individual areas to enhance, consider how to tie your interior vision to the outdoors. The outside décor should be a preview of the interior. Find a theme that works in both areas and use transitional areas such as the entry door, front porch, foyer and three season room to make a statement. After deciding on a theme, establish a color palette. While that may sound a bit formal, deciding what colors will work best throughout your home will make the actual decorating process much simpler. For example, the candlesticks on your dining room table just need a festive touch. Do you add a touch of rose gold, or traditional red? Are you mad-for-plaid or believe you can never have too much glitter? Think it through and you will spend less time wondering what to do, and more time enjoying the seasonal splendor you’ve added to your home. Safety Tip: Do not create a fire hazard with your décor. Be careful not to place items too close to light fixtures, bulbs, or candles. Now is the time to act! With plan in hand, test your lights, take inventory of what you have on hand, and make your shopping list. Shop early – while your favorite store has a full selection. The odds of finding a matching string of lights decreases dramatically the later you shop! Aside from product availability, the other great advantage of beginning the decorating process early – it allows you time to engage help from friends and family and get into the spirit. Pull out the punch bowl and make it a party! Safety Tip: Work with a partner and make it a “team lift” to pull those décor boxes & bins out of storage – don’t throw your back out this season! Safety Tip: Lights are a decorating staple, but don’t overlook potential risks. Put your lights on timers, set to turn off around your bed-time. Check to see lights are UL listed, and are functioning properly. Do not use strands with frayed wires or overload your outlets. Lastly, check to make sure your lights are UL listed. Don’t think you have to spend a huge chunk of your holiday budget on décor! Inexpensive items such as mason jars, ribbon, and burlap from the local craft store are budget-friendly and can be used to make your seasonal scheme unique. Wondering what to do with all those “old-fashioned” colored bulbs from the string of lights that doesn’t work? Use them to fill a cylinder vase for a quick and easy coffee table decoration. Mason jars work great (indoors and out) for tea lights and add an instant down-home charm to a room. Boxwood and magnolia (real or artificial) tucked into a napkin ring or surrounding a poinsettia grouping are easy ways to bring a pop of greenery to your room. Safety Tip: Beware of “Look-alikes” Those cute candy cane ornaments you hung in the front windows could be realistic enough to fool a toddler, or the family dog – same goes for candy, popcorn, or cranberry garlands. And while poinsettia are the holiday plant, they are mildly-toxic to cats and dogs, so be thoughtful regarding their placement. If you’re not the hot glue gun/crafty type – don’t despair. Create an “idyllic scene” by staging a vintage sled and pair of ice skates from the resale shop next to your existing entryway table to welcome guests into your holiday home. Festoon the staircase with the traditional boughs of holly or take it up a notch by adding hand-painted ornaments you ask your family members to make. One of the advantages of “DIYing it” is the ability to make it personal. Love hockey? Ask your kids to help you create a “tree” out of old hockey pucks for the holiday “kids table” and they’re sure to help. Most importantly, don’t forget to ask your spouse or significant other where to hang the mistletoe ©. Safety Tip: When stringing lights and decorations like mistletoe above your normal reach, make sure to use a ladder with someone supporting the base. A sturdy step stool may be enough, but never use a folding chair! Of course, you’ll want to hang the stockings by the chimney – with care – but don’t overlook the less obvious areas. The light fixture above the dining room table is calling out for decorated wreath. Adding seasonal finger-tip towels, soaps or a reed diffuser to your powder rooms tells guests that you’ve got it together this season! Place a book bin of seasonal stories and ribbon-wrapped birch branches next to the hearth to invite fireside gathering. Safety Tip: Before enjoying your fireplace, make sure to have the chimney cleaned and remove accumulated ash and soot from the grates and doors. Also, ensure you are burning dry wood – not treated with pesticides. Finally, as tempting as it may be, don’t burn wrapping paper! Keep the chemicals out of your hearth and home. The holidays wouldn’t be the same without a bountiful table of you family’s favorite foods. Whether your prepping brunch or setting a formal table with the “good china”, pull in your theme and color palette when staging and plating. Use charger plates, napkins, hors de vours platters, seasonal barware, even chair wraps for that festive touch. Your holiday tree. In many homes, the tree or trees, are the symbol of the holiday season. A simple theme can make quite a statement when you trim an entire tree, even if it’s a miniature, in the same color ornament, garland, and lights. If you have small trees throughout your house, consider coordinating themes such as candy, food, or cocktails. Extend the theme to your gift giving. If you plan to have presents under the tree, you can up the wow-factor by coordinating your wrapping. This extra step is a 2-for-1: your tree will look like a Michigan Avenue window with coordinating gifts, and your presents will be memorable even before they’re opened! Safety Tip: Make sure to place your tree away from fireplaces, radiators, or heat vents. Before hanging the first ornament make sure your tree has a level stump and is secured in a sturdy tree stand. Last step: water! A well-watered tree is a safe tree, and one that keeps its needles throughout the season. Season’s Greetings from the Erdmann family. Keep it simple, keep it safe, and enjoy your home this holiday season.